Die Kreuzen from the Elk’s Lodge in Atlantic City. Starts off with their cover of the Halloween movie theme. Then they played a mix of short fast stuff from their first self titled LP and a bunch of longer songs from my favorite Die Kreuzen album October File. I remember seeing them at the Kennel Club around this time but it might have been 1986. 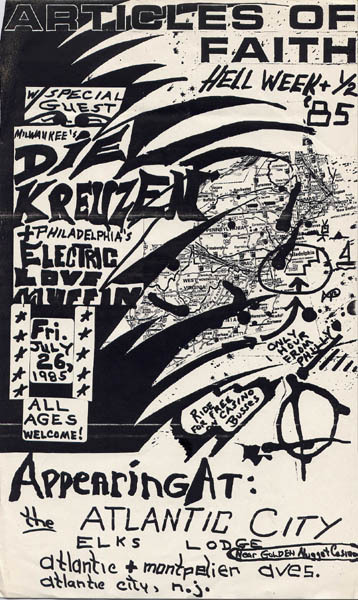 Earlier I posted the audio from a much later Die Kreuzen show from the Khyber. Thanks a lot for this one. Always found the mid to late Die Kreuzen more interesting that their earlier stuff. This one is a great mix of the two.